The UK's new minister in charge of broadband has taken a scythe to the red tape surrounding roll-out of next-gen superfast services. 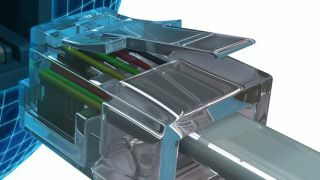 Maria Miller, the newly minted secretary of state for culture, media and sport, has proposed changes to planning regulations that will allow ISPs to install cable cabinets without needing planning permission. Only the country's 4,000+ sites of special scientific interest will require permission before a box can go up under the new plans. These are sites that house protected wildlife and the like. "We are putting in the essential infrastructure that will make UK businesses competitive, and sweeping away the red tape that is a barrier to economic recovery," Miller said. "The government means business and we are determined to cut through the bureaucracy that is holding us back." This more flexible way of working should save ISPs time and money as they scramble to implement superfast broadband around the country by the government's target date of 2015. Still, we're half expecting to see the green street boxes popping up in the most ridiculous places as they become easier to install. Let us know if you see any.